The entire six square kilometer island is now a UN World Heritage Site. A forlorn yet tranquil atmosphere permeates the place. One can almost hear audible sighs of relief from the island, once a haven for seals and ocean birds before sailing ships rounded the Cape. Sailors relentlessly plundered it for fresh seal meat and penguin eggs. Eventually it became a dumping ground for exiles and criminals. In the 17th century the Dutch were the first to banish their political troublemakers and Muslim leaders from the East Indies. Today there’s a beautiful shrine, called a kramat, built in honor of Tuan Guru. After his release this Muslim holy man went on to found Islam among Cape Town’s slaves. 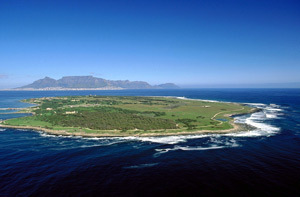 Xhosa chiefs who rebelled against British rule were shipped to the island from the Eastern Cape. From the mid 1800’s criminals, prostitutes, outcasts, lepers and the mentally ill joined them. All were subjected too much cruelty and abuse. In 1961 the Prisons Department took over and built an austere maximum-security prison. It was here that Nelson Mandela was sent after receiving a life imprisonment sentence in 1963. Political and common-law prisoners were initially lodged together. Contact with the outside world was limited to receiving and sending two letters a year. In 1971 the political prisoners were further isolated. Beatings, hard physical labour in the lime quarry, prolonged solitary confinement and insufficient food, bedding and clothing were endured for many years. Hunger strikes, legal action and international pressure eventually brought better conditions. The prison even became an informal university behind bars, with prisoners tutoring their warders. 1991 saw the release of the remaining political detainees and in 1996 the common-law prisoners were transferred to the mainland. 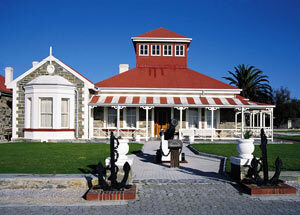 Daily tours depart by ferry from the Nelson Mandela Gateway at the Waterfront. The ferry trip takes 30 min to the tiny harbour. From there a bus ride takes one to historic places like the kramat, leper graveyard, a church designed by Sir Herbert Baker and the lime quarry where political prisoners endured lengthy hours of tough physical labour. Driving along the shipwreck strewn coast you can spot some antelope, plentiful seabirds and the lighthouse. The last stop is the maximum security prison. 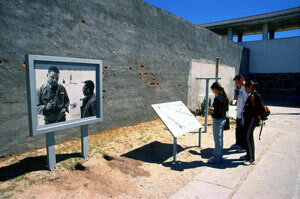 The guides are former inmates and will take you along the Footsteps of Mandela tour in the notorious B-section. Mandela’s sparse cell is open, the others locked and empty. The A-section houses the Cell Stories exhibition, evoking the meagerness of prison life. Former prisoners have loaned personal items including an amazing saxophone that works, crafted from found bits and pieces. Have a look at the Smuggled Camera Exhibition in the communal cells. Prisoners managed to slip cameras onto the island in the late 1980s. The enlarged photos are warming, giving an indication of their solidarity, friendship and expectancy that it would soon be over. The entire trip lasts three and a half hours and costs around R150.